CANCELLATIONS MUST BE MADE THE SAME WAY THE RESERVATION WAS MADE. TELEPHONE CANCELLATIONS WILL NOT BE ACCEPTED UNLESS RESERVATION WAS MADE BY TELEPHONE. Cancellations must be made within 2 weeks of arrival date in July and within 3 days of arrival date for all other months in order to qualify for any refunds. Cancellations not made within these time frames will result in zero refunds and possibly additional charges. Credit card numbers serve as Deposits. Must have credit card to rent any room. Online reservations pay in full at the time of reservation. Pets are allowed in pet rooms with a 10.00 USD per night pet fee. Signature of a pet policy and a credit card number on file for damages is required. 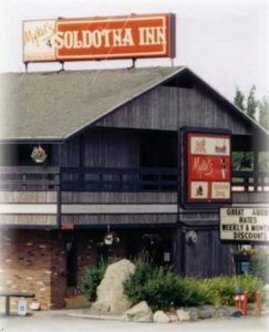 The Soldotna Inn has a 20 unit hotel, an 8 unit apartment complex for short-term rentals, a full-service fine dining restaurant and a banquet facility. Centrally located in Soldotna, a perfect starting point for many day trips exploring the Kenai Peninsula. Close to shopping, golf and only a short walk from the majestic Kenai River which offers the worlds best fishing. All rooms have microwave, small fridge, coffee pot, cable TV with HBO, free local phone and free wireless internet access. Apartments have fully furnished kitchens and living rooms. Free continental breakfast served in our lobby. Pets are welcome. We have been in business for more than 30 years and pride ourselves in the finest customer service available on the peninsula. We consider ourselves the locals favorite choice for where to send their friends and family for a comfortable nights stay and a great meal. Our website is www.mykels.com and our email address is soldotnainn@alaska.com.